In large bowl, mix all ingredients. Shape mixture into twenty 1 1/2-inch meatballs. Place in ungreased 13x9-inch pan or on rack in broiler pan. Bake uncovered 20 to 25 minutes or until no longer pink in center and thermometer inserted in center reads 160°F. Shape meatballs fast by using an ice-cream scoop. Or instead of shaping balls at all, pat the mixture into a 9x3-inch rectangle in an ungreased 13x9-inch pan. Cut into 1 1/2-inch squares, and separate slightly. Bake uncovered 25 to 30 minutes. 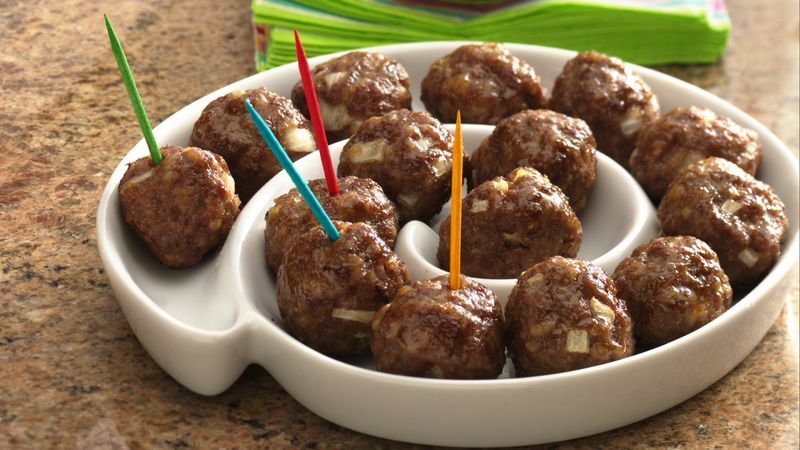 Shape beef mixture into 1-inch meatballs. Bake 15 to 20 minutes. 3 dozen appetizers. Substitute 1 lb ground turkey or chicken for the ground beef. (If using ground chicken, decrease milk to 2 tablespoons.) To bake, spray rectangular pan with cooking spray; bake until no longer pink in center and thermometer inserted in center reads 165°F. To cook in skillet, heat 1 tablespoon vegetable oil over medium heat before adding meatballs; cook until no longer pink in center and thermometer inserted in center reads 165°F. Skillet Meatballs: In 10-inch skillet, cook meatballs over medium heat about 20 minutes, turning occasionally, until no longer pink in center and thermometer inserted in center reads 160°F.